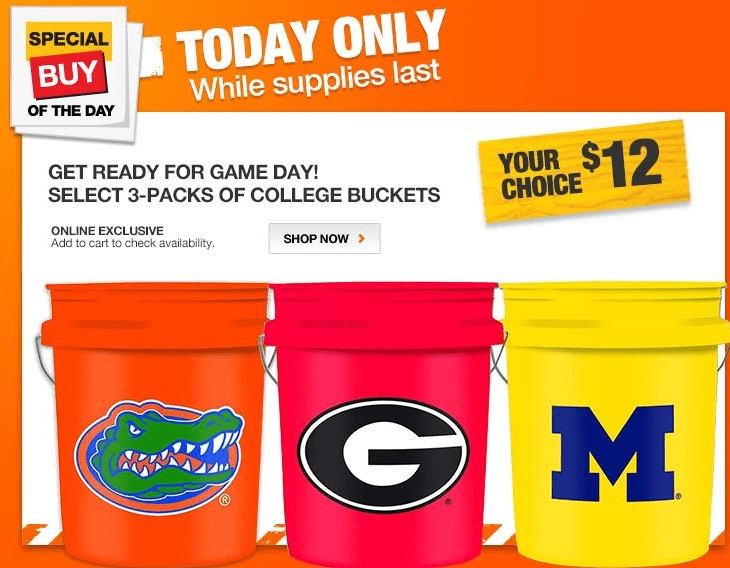 HomeDepot.com has these nice College Buckets for 3 for $12, today online! If Maryland was offered, I would totally jump on this deal. Hopefully your school is on there! Shipping is FREE and remember, the deal is only good today. These buckets would be so great for tailgating, manly/sporty gift baskets, and just using around the house (like to hold chicken feed.. because $4/bucket is a good deal)! First, go through Ebates or ShopatHome to get a percentage of cash back for extra savings! To easily find the buckets, just type “College Buckets” in the search. You’re looking for the 3 packs for $12.